← Hollywood Lied. People Died. Henry II of England nominated Thomas-a-Becket to be Archbishop of Canterbury because he firmly believed that Thomas would be loyal first to the State and second to Rome. Someone did. Thomas, chosen to be a tool of the State, grew a backbone and became a martyr for the Faith. During Mao’s “Cultural Revolution” Catholicism was made illegal. The millions of Catholics in the country were put into labor camps. Mao put about 60 million citizens to death. After the Cultural Revolution was completed, Catholicism in China went underground. However, the Communist government decided that it preferred the devil that it could see to the devil that it could not. The Communist government created the Chinese Catholic Patriotic Association, an allegedly “Catholic” organization managed by the Chinese government that repudiated allegiance to “foreign powers” such as the Pope. The Communists rounded up priests and Catholics and tried to register them with the Communist regime as part of the Patriotic Association. Many Catholics risked torture, brutality, and martyrdom by instead staying “underground.” These Catholics were ministered to by the Vatican Congregation for Evangelization, which handled the underground Church as a mission Church operating under historic persecution. The Vatican Secretary of State, however, attempted to work with the Communist regime. The Communist government and the Catholic Church sought to find candidates acceptable to both. The Communists viewed these CCPA Bishops as primarily loyal to the Communist Party. The Vatican viewed these CCPA Bishops as primarily loyal to the Vatican. In order to agree only to suitable candidates, the Vatican worked in consultation with the “underground” Catholic Bishops to give canonical jurisdiction to some candidates who were often first appointed by Bishops from the CCPA. Until 2000, the Vatican process for reviewing candidates was very thorough. In 2000, according to Cardinal Zen, the leading Catholic critic of the Chinese government, the Vatican became too accommodating to the Communists — allowing unsuitably weak candidates to become Bishops. Now, the truth is that some CCPA Bishops are more loyal to Rome. Others are more cronies of the Communist regime. However, in the last year, the Vatican has grown a stronger backbone, insisting that Bishops can only be appointed with the approval of Rome. The Communists have responded by upping the ante — appointing schismatic Bishops, an action that incurs canonical automatic excommunication for the Bishop ordained and those participating in the ceremony (as occurred also with SSPX). The matter is complicated by the fact that Bishops are often pressured into participating in illicit ordinations. This confrontation between Rome and Beijing is forcing CCPA Bishops to choose sides. Some CCPA Bishops are finding their inner Thomas-a-Beckett and refusing to participate. If Beijing continues to force this confrontation with Rome, they will increasingly force the Bishops more loyal to the CCPA into formal schism. This heavy-handed strategy may not work as the Communists plan. The more schismatic and excommunicated the CCPA becomes, the less influence the Communists may have on authentic Catholicism. Currently, about 8 million Catholics are “underground” — ready to suffer martyrdom if apprehended. And this number is swiftly growing. About 5 million Catholics attend Mass with the CCPA. There is some mingling between CCPA Catholics and “underground” Catholics. And many CCPA Catholics are truly loyal to Rome in their hearts. In other words, Catholics represent about 1% of China’s population. 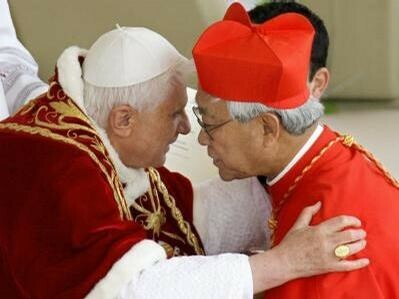 Cardinal Zen has been aggressive about speaking up about this confrontation and the danger and opportunity it presents. Authentic Christianity, following Christ to the end — even, if necessary, to death — is the calling of every Catholic. As the Communists force the CCPA increasingly into schism and excommunication, we must pray that Chinese Catholics associated with the CCPA — particularly the Bishops under the watchful eyes of the Communist regime — find the courage to find their inner Thomas-a-Becket and remain unfailingly loyal to Rome. And may Christ lead them along the path to Greatness.